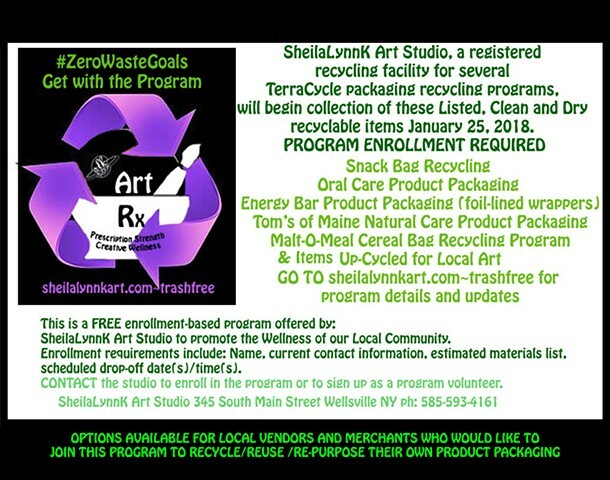 SheilaLynnK Art Studio is a registered recycling facility for several TerraCycle packaging recycling programs. To supplement the recycling program already offered by our local department of public works; Collection of LISTED, CLEAN and DRY recyclable items will take place at the studio January - December 2018. In order to recycle this waste stream properly, please make sure all excess product has been removed. Please note that it must be completely dry prior to drop-off. Open and unfold bags, pouches, and wrappers to ensure cleanliness, ease drying time, and minimize storage space. Open toothpaste tubes along the bottom seam and up the side, fold open, scrape out contents, wash, rinse, and dry completely. Thoroughly wash, rinse, and dry ALL containers prior to transport drop-off at the studio. When applicable, please neatly flatten, fold, and bundle items (i.e. wrapped with twine, or in a paper bag,etc.) for easy sorting, storage, and prep for shipping. Consumers ARE able to recycle film plastics at certain retail stores and most grocery stores. Stores must make recycling collection bins for film plastics available to customers in a visible, easily accessible location. If film plastics collection containers are not available in a regulated store, please email recycling@dec.ny.gov or call (518) 402-8706. We will need the store name and location (street address and city). What are Acceptable Film Plastics for Recycling? The FREE enrollment-based program at SheilaLynnK Art Studio is designed to benefit Local and Global Wellness. Name, current contact information, estimated materials list, scheduled drop-off date(s)/time(s). CONTACT the studio to enroll in the program and/or become a program volunteer. Please provide: your name, contact information, what town you are from, list the items you intend to recycle, and suggestions for your drop off day/time. You will receive a confirmation email when your registration is complete. This form (an attached printer-friendly pdf) is for local patrons who have items on the Recycling Program list that they would like to drop-off for recycling. Consult the following links for pdfs with more details about these materials collected at the studio. Please print responsibly. Recycling program drop-off/pick-up options are also available for local artists, merchants, and vendors COLLECTING items. "GREEN MATTERS" my bloggy post about the decision to provide this local service.